When famous Texas oilman T. Boone Pickens tells The New York Times, “I have the same feelings about wind as I had about the best oil field I ever found,” and says he will spend $10 billion to build the world's biggest wind farm, you can say that wind energy has arrived -- even in the former petroleum capital of North America. Texas "is rapidly turning into the capital of wind power," Clifford Kraus reports for the Times from Sweetwater, where Brian Harkin took this photo of workers on a wind turbine. "After breakneck growth the last three years, Texas has reached the point that more than 3 percent of its electricity, enough to supply power to one million homes, comes from wind turbines." According to the American Wind Energy Association, the No. 2 through 10 states in megawatts from wind are California, Minnesota, Iowa, Washington, Colorado, Oregon, Illinois, Oklahoma and New Mexico. Wind power is booming "amid rising concern about greenhouse gases from coal-burning power plants," Krauss writes. "Installed wind capacity in the United States grew 45 percent last year, albeit from a small base, and a comparable increase is expected this year. At growth rates like that, experts said, wind power could eventually make an important contribution to the nation’s electrical supply. It already supplies about 1 percent of American electricity, powering the equivalent of 4.5 million homes. Environmental advocates contend it could eventually hit 20 percent, as has already happened in Denmark. Energy consultants say that 5 to 7 percent is a more realistic goal in this country." Roanoke Times explores a touchy question: Should ministers evangelize at funerals and weddings? The Rev. Kenneth Wright of First Baptist Church in Gainsboro, Va., preached during a recent funeral service. The photo by Jared Soares of The Roanoke Times illustrates a story that gets to a basic question, rarely discussed in public, about one of the most emotion-laden moments in life: Should evangelical ministers evangelize at funerals and weddings? "In an era when church attendance in many denominations is in decline, some pastors see funerals and weddings as increasingly important venues for oratory that can border on revivalism," reports the Times' Rob Johnson. "The one place nonbelievers will step into a church in our day is at weddings and funerals," the Rev. Quigg Lawrence, pastor of the Church of the Holy Spirit, an Anglican evangelical congregation near Roanoke, told Johnson. On the other hand, "Some pastors say that although a bit of preaching is acceptable, they're wary of a message that puts pressure on guests at weddings or funerals to examine and perhaps affirm their faith then and there," Johnson writes. "After all, they reason, nonbelievers should be allowed to share grief or joy for loved ones and friends." The Rev. Bryan Smith at First Baptist Church in Roanoke "believes that all pastors will someday have to answer to God on whether they took every chance to spread their faith," Johnson reports. "But when it comes to the standard evangelical punchline, extending an invitation for those present to either affirm their commitment to Christ, or make one for the first time, he asks permission ahead of time from the family of the deceased or the wedding couple. He's rarely denied." Johnson has other good interviews, and a nice back-and-forth box giving pros and cons of preaching at funerals and weddings. It's a good example of how to tackle a touchy subject. To read it, click here. "In a victory for gun-rights advocates, the federal government is preparing to relax a decades-old ban on bringing loaded firearms into national parks . . . in states with few gun restrictions," report Richard Simon and Judy Pasternak of the Los Angeles Times. Interior Secretary Dirk Kempthorne responded to pressure from members of Congress, including 50 senators. "Senators from both parties have backed a drive to repeal the ban, which has been in place in some parks for at least 100 years," the Times notes. The National Rifle Association and other Second Amendment groups praised the action as common sense. ""If you're hiking in the backcountry and there is a problem with a criminal or an aggressive animal, there's no 911 box where you can call police and have a 60-second response time," Gary S. Marbut, president of the Montana Shooting Sports Association, told the Times. The West Virginia Senate Judiciary Committee "shot down a bill that aimed to expand an anti-discrimination law that covers miners who report, file complaints or testify about alleged safety rules violations or dangers," reports The Associated Press. The bill lost 8-6. "The measure sought to increase the circumstances under which miners can allege unsafe conditions without fear of firing or other retaliation," AP reports. The circumstances included refusal "to work in an area or under conditions which he or she believes to be unsafe." "Peake, who was appointed to the post by President George Bush two months ago, said that more than one-third of Montana's vets live in extreme rural conditions, compared to about 1.7 percent of vets nationwide," Newhouse writes. Earlier that day, Peake announced the creation of a rural health advisory committee to advise senior leaders of the agency about health care issues affecting veterans in rural areas. A news release from the VA offers an overview of the advisory panel's goals. The VA's Web site also links to a 2004 study comparing rural and urban veterans, which "shows those in rural areas are in poorer health than their urban counterparts." Earlier this month, we mentioned a study from the journal Science that said increased production of biofuels would increase greenhouse gas emissions due to the conversion of more land to crop production. The study continues to get coverage, but now two researchers from the Department of Energy "found fault with a number of assumptions in the study, including about how land is currently being used and how much crop yields may increase in coming years," reports Philip Brasher of the Des Moines Register. Most recent studies on biofuel production have touted using waste products such as corn stover to make biofuels, but a recent poll suggested Iowa farmers are hesitant to do so. Iowa State University's 2007 Survey Report on Iowa Farmers' Views on the Bioeconomy found that while 79 percent of farmers surveyed though ethanol production could help rural areas, almost as many had concerns about the economic impact of using corn stover or bringing marginal land into production. "Reactions to the prospective removal of corn stover for ethanol production were negative on the whole, with 75 percent of farmers in agreement that doing so would increase soil erosion," according to the report. "Likewise, 77 percent of farmers agreed that bringing marginal land into grain production—a distinct possibility if ethanol-induced price increases are maintained—would reduce wildlife habitat." For other parts of the Iowa Farm and Rural Life poll, go here. There are plenty of resources on the Web for data to help reporting on local schools — as long as you know where to look. Katherine Boehret of the Wall Street Journal reviews three good sites for education research: Education.com, GreatSchools.net and SchoolMatters.com. Education.com includes a school finder feature that lets users compare public and charter schools (from elementary through high school). The site currently only has data from California, Florida, Georgia, Illinois, Michigan, New Jersey, New York, Ohio, Pennsylvania and Texas, but it says other states will be added soon. The older GreatSchools.net has a similar feature, but it has all 50 states and it includes some information on private schools. (I searched for my Catholic grade school and found teacher-to-student ratio, some parents' reviews and an overview.) While the other two sites also include articles on education and children, SchoolMatters.com focuses on data and users can find plenty. Another useful site is SchoolDataDirect.org, sponsored by the Bill & Melinda Gates Foundation and the Council of Chief State School Officers. The site offers current national, state and local information on schools, including test scores, finances and demographics. The downside, however, is the site is not geared to journalists and seems to discourage reporters from using it too often. A disclaimer on the site reads: "If you are not associated with an academic institution or nonprofit organization you may only reproduce, distribute, display, or transmit de minimus amounts of Education Data on an infrequent basis and only for noncommercial purposes." "Gray wolves once were plentiful from central Mexico to the Arctic, but were killed off for decades, and by the 1930s had virtually disappeared from the American West," Abdollah writes. "In 1974, they were listed as endangered. 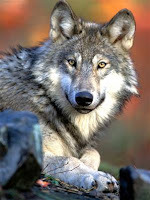 Since then about $27 million has been spent by the federal government to conserve the wolves." Donald Norman Soldwedel, the man behind multimedia enterprise Western Newspapers Inc. and a member of the Arizona Newspaper Hall of Fame, died Wednesday in Tucson at 83. In an editorial, The Daily Courier of Prescott, which Soldwedel acquired in 1958, called him "an ideal prototype" for a newspaper leader. Soldwedel built Yuma-based WNI into a collection of "three daily newspapers, 12 non-dailies, 44 specialty publications, two radio stations, two telephone directories, an outdoor advertising company, a specialty sign firm, two central printing plants, one commercial print shop, and numerous news and advertising-related websites," The Courier writes in an obituary. "Cooperatives are nothing to new to farmers, who often pool their crops to gain pricing power," Lee writes. "Today, farmers are increasingly applying the co-op model toward wind power, a booming industry that's attracting plenty of attention from politicians and investors, especially in Minnesota, where lawmakers last year passed a bill requiring energy companies to provide 25 percent of their power through renewable energy by 2025." National Wind has 15 co-op wind projects in development in Iowa, Minnesota, North Dakota and South Dakota. "Through a joint ownership structure, the company provides financing and wind-power expertise while the farmers contribute land and, perhaps most important, legitimacy to complex wind projects that get bogged down by regulatory hurdles and local sensitivities," Lee writes. "National Wind will typically own 30 percent of the project; the rest belongs to local farmers and landowners." A bill to make clear that records in South Dakota are public, unless the law says otherwise, is probably dead for this session, the bill's sponsor said after a House committee voted 7-6 against it, reports Terry Woster of The Argus Leader of Sioux Falls. "Critics said the bill went too far and would not protect disclosure on private individuals and corporations, even though it included a ban on “unwarranted release' of information that would endanger the public or cause “irreparable harm to an individual,” writes intern Alanna Malone of the Reporters Committee for Freedom of the Press. The sponsor, Sen. Nancy Turbak Berry, D-Watertown, told Woster that she probably would not try to revive Senate Bill 189, which grew out of her service on a state task force and was supported by the South Dakota Newspaper Association -- but opposed by Gov. Mike Rounds. The Reporters Committee said South Dakota is the only state without a law presuming records are open. "State law generally says records required by law to be kept are open. Numerous specific laws close different individual records or classes of records," Woster writes. But the task force "found that a vast number of records fall somewhere between those two areas. It also found that government officials have wide discretion to make decisions on whether to open or close records. The task force was unable to agree on a bill making substantive changes in open-records laws," so Berry filed the bill, which would have "put the burden on government to show why a document should be closed." The appeal of maple syrup has long traveled far beyond the woods of New Hampshire and Vermont; now that appeal has reached Europe and Asia. That growth in customers, plus the weak U.S. dollar, has helped the American maple industry outsell its Canadian rivals, former New Hampshire agriculture commissioner Steve Taylor writes for The Valley News in White River Junction, Vt., and Lebanon, N.H.
"Folks long used to buying a gallon of new-crop Vermont or New Hampshire syrup hot from the evaporator for $35 will be in for a surprise this year, for the reality is that there are buyers in Japan or someplace else who are willing to pay far more, although it will probably be packaged in many tiny bottles," Taylor writes. "Though these new economics may make it seem like a bonanza is in the offing for syrup producers, sharp increases in energy costs for evaporating and for the plastic tubing that is now the norm for gathering sap will restrain any exuberance." With the struggles of major newspapers much in the news, the Missouri Press Association wants to address the issues that are behind declines in circulation and readership. In February's Bulletin, the MPA's publication, the organization announced it would be working with Strategists LLC to "develop a message on the value of newspapers to reach and influence your existing and potential subscribers and readers." MPA Executive Director Doug Crews told us the association plans to hold a March 13 meeting to discuss the initial ideas and visions for the campaign. If you have ideas for him, feel free to contact him. Go here for full contact information for the MPA. "Barack Obama’s win in Wisconsin Tuesday underscored his rising popularity among rural voters, a constituency that some political observers say has been neglected by national Democrats," writes Neil H. Simon, a Washington reporter for Richmond-based Media General News Service. Simon cites the analyses of the Center for Rural Strategies, which categorize counties as rural, exurban or urban, based on boundaries of metropolitan areas. They showed Obama getting 37 percent of the rural vote on Super Tuesday, 51 percent the following week in Virginia and Maryland, and 55 percent in Wisconsin last Tuesday. For the Wisconsin analysis, from the Daily Yonder, click here. Exit-poll results, based on precinct locations, showed a similar trend. The center's vice president for communications, Tim Marema, told Simon that rural voters may just be part of a national Obama bandwagon, because the candidates “have not really made the types of substantive overtures to rural people that would explain the change.” Whatever the reasons, “Rural support is essential support for Democrats to get elected,” U.S. Rep. Rick Boucher of rural Southwest Virginia's 9th District, an Obama supporter, told Simon. Hopkinsville and Christian County, Ky., are in a metropolitan area with Clarksville, Tenn., centered on Fort Campbell, but in the city of 30,000 a grain elevator is the tallest building. Only 13 percent of adults in the county have college degrees, but the Hopkinsville Rotary Club aims to increase that number by giving free rides to most high school graduates, reports Jennifer P. Brown of the Kentucky New Era. "Beginning in 2012, students who finish high school with at least a 2.5 grade point average and a good attendance record will be eligible for full-tuition scholarships to attend Hopkinsville Community College," Brown writes. "This year's eighth graders will be the first to qualify for the scholarships." Rotarians said the scholarship is unique in Kentucky since it offers aid to students who "simply maintain at least average grades," Brown writes in a follow-up story. While in college, the Rotary Scholars must maintain a 3.0 grade point average in college, the same grades required for students who receive federal Pell grants. Many rural areas are still waiting for something many Americans take for granted: access to the Internet. Logistical and geographic obstacles have kept more than a third of rural Americans without Internet connections, and so the issue requires some creativity, such as the answer from Space Data Corp. which is drawing attention from Google. Space Data sends balloons carrying a "shoebox-size payload" of electronic gear 20 miles into the stratosphere, and from that height, they offer miles of wireless coverage below, reports The Wall Street Journal's Amol Sharma (who also took the photo). The balloons don't float forever; after about day, they pop and the electronics — protected by Styrofoam — glide back to earth on a parachute. 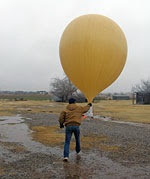 "This means Space Data must constantly send up new balloons," Sharma writes. "To do that, it hires mechanics employed at small airports across the South. It also hires farmers — particularly, dairy farmers." The farmers are paid $50 per launch, and the company offers $100 for every electronics unit recovered. 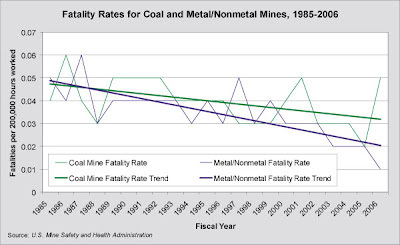 The federal budget for coal mine safety and health in the Mine Safety and Health Administration "has been particularly abused" for the last 30 years and when adjusted for inflation is 15 percent less than it was at its peak in 1979, reports OMB Watch, the government watchdog publication that focuses on the Office of Management and Budget. "Even though MSHA's budget increased in the late 1990s and in the early 2000s, employment levels struggled to grow, and since FY 2001, have dropped," the report says. "From FY 1997, when the agency's budget reached its historical nadir, to FY 2007, the agency's budget grew almost 19 percent when adjusted for inflation. However, staffing levels did not follow a similar trend. In FY 2006, MSHA's staffing level reached an all-time low of 2,078. . . . With national attention focused on high-profile mine disasters, Congress and President Bush have made efforts to bolster the program's budget. However, it is still lower than it was throughout the 1980s. " The report also notes, as we have here, MSHA's failure to make required inspections and meet deadlines to rulemaking under new mine-safety laws, and a recent critical report on such issues by the inspector general of the Labor Department, MSHA's parent agency. High school sports are serious business in many rural areas, and local radio stations still carry all the big games live. Those basketball and football games get taped and then get packed away, but a radio station in Carthage, Tenn., dusted off some old football game tapes and started replaying them in the off season. The idea has paid off for WUCZ-FM/WKRM-AM. "It turns out that the 40-year-olds of today love to listen to their glory days," writes Al Tompkins for Poynter Online. "And those 40-year-olds now are the community business leaders, so naturally they buy ads for the flashback games." Tompkins interviewed the man behind the idea, Dennis Banka, during a workshop with the Tennessee Broadcasters Association. The interview is available here. Pennsylvania passed its Right to Know Law in 1957, and the state had not changed the open- records law since. Last week, Gov. Ed Rendell (in a photo from the Pennsylvania Newspaper Association) signed Senate Bill 1, which overhauled the law and helped the state begin to "shed the unflattering distinction of having one of the worst records in the nation -- many believe it is the worst -- on providing access to government documents," reports Angela Couloumbis of The Philadelphia Inquirer. The new law makes all state and local government records public unless "specifically exempted," and it creates the Office of Open Records to handle disputes between the public and agencies, Couloumbis explains. Still, the law does not make 911 transcripts or autopsy reports public, two types of records that are available in many other states. "There is nothing in the bill that is unusually open or exotic, but it does call for good, solid, mainstream, ordinary transparency," Lucy Dalglish, executive director of the Reporters Committee for Freedom of the Press, told Couloumbis. The Pennsylvania Newspaper Association also praised the law. "In 2006 we rolled out anambitious legislative initiative, titled 'Brighter Pennsylvania,'" PNA President Tim Williams said in a news release. "Our goal was to improve Pennsylvania's open records law, which is widely regarded as one of the worst in the country, and expand citizens' access to government. Senate Bill 1 accomplishes a number of our goals." For more coverage of the legislation, including reaction from the state's newspapers, go here. While other states have more experience with agri-tourism, Iowa and its farmers are working to catch up and cash in, reports Erin Crawford of the Des Moines Register. 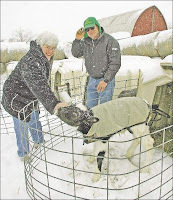 The trend of using farms as tourist draws began in Vermont about 25 years ago, and states such as Kentucky and Nebraska have created cooperative groups and Web sites to encourage the industry. Because Iowa "hasn't developed a cohesive marketing effort for the state's agri-tourism," the state trails its neighbor, but some groups are to trying to change that, Crawford writes. Dianna and Loren Engelbrecht (in a Register photo by Harry Baunert) "are among the few in Iowa to offer farm stays, which treat the farm as a mini-theme park, with cows and chickens instead of roller coasters and bumper cars," Crawford writes. "About 80 percent of the approximately 1,000 tourists they attracted last year live in urban areas." The U.S. Department of Agriculture provides information on agritourism here. Congress may be on its Presidents' Day break, but negotiations about the Farm Bill continue as the House and Senate try to reconcile their versions of the bill, reports Peter Shinn of Brownfield Network. Last week, the House Agriculture Committee submitted a bipartisan proposal that "called for raising no revenue and spending about $6 billion over the Congressional Budget Office baseline for farm programs," while the Senate committee countered with an offer that spent $12.3 billion over the baseline, Shinn writes. Now, the two sides are trying to meet in the middle, Sen. Chuck Grassley (R-Iowa) told Shinn and other reporters on Tuesday. "The Senate received a counter-offer from the House of the Representatives over the weekend on the farm bill," Grassley announced. "It's my understanding that that proposal was $8 to $10 billion over baseline compared to the Senate counter-offer to the original House bill." "Pest infestations in recent decades caused a decline in cotton acreage, and the decline accelerated as fuel costs soared and urban centers like San Diego, about 90 miles to the west, pushed for a larger share of the state’s stretched water supply," Cathcart writes. "Cotton is a water-intensive crop, and the fields here are irrigated by canals that draw from the Colorado River, the source of drinking water for much of Southern California." Barack Obama probably carried the rural vote in winning Wisconsin's Democratic presidential primary tonight, according to the exit poll for the National Election Pool composed of television networks and other major media outlets. Pollsters deemed 33 percent of their sample precincts to be rural, very close to the state's rural-population figure of 32 percent in the 2000 census. At those precincts, Obama got 53 percent of the poll respondents and Clinton got 45 percent. Applying the error margin of 4.51 percentage points for the sample of rural voters (472) to each candidate's figure, at the standard 95 percent confidence level (19 out of 20 cases), it's possible Clinton carried the rural vote, but not likely. Among the 45 percent of voters that the pollsters considered suburban, Obama led 54 to 46. Among urban residents, he led 62-35. With 99 percent of the statewide vote counted, Obama led Clinton 58.7 percent to 41.2 percent, with 0.1 percent voting for "uninstructed" delegates. By geographic area, Clinton won only in the largely rural northwestern part of the state, and by only 51-47, well within the much larger error margin for that sample (20 percent of the statewide total). Clinton also had marginal edges among other subsamples: 52-47 among white Democrats (the primary was open), 51-48 among the 12 percent of voters who said the race of the candidate was important, and 50-47 among the 35 percent who said national economic conditions are poor. Obama carried white voters overall, 52-46, just outside the error margin. With heating costs on the rise, many rural residents are turning to cheaper alternatives to keep warm this winter. In New England, wood has made a comeback with many homeowners who are put off by the rising cost of oil, reports Katie Zezima of The New York Times. "After years of steep decline, wood heat is back, with people flocking to dealers to buy new wood stoves, wood boilers and stoves that burn pellets made of wood byproducts.," Zezima writes. "Others ... to the dismay of environmentalists, are dusting off old wood-burning devices that are less efficient and more polluting." In the Midwest, rising propane costs are a major concern for rural residents who depend on deliverable fuels for heat. For state-by-state energy profiles, go here. For more than a decade, two West Virginia lawmakers have tried to make a gun safety course part of the high school curriculum. Unsuccessful so far, they are making progress with their latest attempt, in which "gun safety" becomes "hunter safety," veteran statehouse reporter Mannix Porterfield writes for The Register- Herald in Beckley. Sens. Billy Wayne Bailey, D-Wyoming County, and Shirley Love, D-Fayette County, introduced the bill that would compel the states' schools to "offer the optional instruction period" for a "two-week, 10-hour course that dovetails with graduation requirements for physical education classes," Porterfield writes. Bailey said the bill could help address a decline in hunting because young people would be able to gain hunting certification from the state's Department of Natural Resources. Currently, new hunters have to take a three-hour evening class to get that license. No live ammunition would be on school campuses and only teachers will handle disabled guns. Nationwide, schools need more teachers for math and science, and the need is even greater in rural areas. A new program aims to attract some teachers to rural areas with the promise of a money for a master's degree, reports Brian Wallheimer of the Journal and Courier in West Lafayette, Ind. Funded by the Woodrow Wilson National Fellowship Foundation, the program will begin in Indiana and will make master's degrees "available for undergraduates finishing their degrees and thinking about teaching or others in the math and science fields who want to change careers," Wallheimer writes. "They must commit to teaching in a rural school for at least three years." Four Indiana schools — Ball State University, Indiana University-Purdue University Indianapolis, the University of Indianapolis and Purdue University — will work with the fellows on their master's degrees and will continue to guide the fellows after they start teaching. The program's goal is to add 80 fellows each year and possibly reach 400 annually soon. The first fellows would enter rural classrooms in 2010. After Indiana, other states will join the program. (Read more) For the official news release on the program, go here. We mentioned the beginning of the "Secrecy in Mississippi" series last week, and the collaborative effort of the state's news organizations came to end this weekend after eight days. The series has highlighted the state's shortcomings when it comes to open government and open records, and it seems some improvements could be on way. "I admit that I was suspicious when senators started talking about beefing up the Ethics Commission, but this is really a good bill," writes David Hampton of The Clarion-Ledger. Hampton, newspaper's editorial director, was interviewed by Mississippi Public Broadcasting, and it's available here. The Hattiesburg paper also compiled information on how other states handle open government issues, and that report is available here. To see the full series and copies of Mississippi's laws on open records and open meetings, go here. "In Kentucky's mountains, cervical cancer continues to threaten women's lives at some of the highest rates in the United States," health reporter Laura Ungar writes. 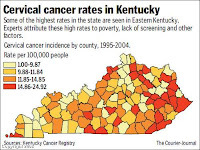 "Women in Eastern Kentucky get cervical cancer at a rate more than a third higher than the U.S. average -- higher than reported rates in Pakistan, Afghanistan and China. Death rates in Appalachian Kentucky are also far higher than the U.S. average." Rates in some Appalachian counties of Tennessee, Virginia, West Virginia and Ohio are similar. "It is comparable to a Third World country," Katie Dollarhide of Whitesburg, Ky., told Ungar. She helps run a cervical-cancer research project and prevention program called Faith Moves Mountains. "The reasons behind the higher incidence and deaths are similar to those in the developing world," Ungar writes. "Poverty and lack of health insurance combine with doctor shortages, transportation problems and a cultural tendency for women to care for others while neglecting their own health." We're talking about "a preventable cancer that has largely been controlled in the United States," Ungar notes. A report from the National Cancer Institute says cervical cancer is high among "Appalachian and other rural whites; rural African Americans, particularly those in the Deep South; Latinas living near the Texas-Mexico border; and Vietnamese American and other Asian women, particularly those in California." For a copy of the report, which has maps showing the range of cancer rates for every county, click here. For Ungar's story and others, click here.